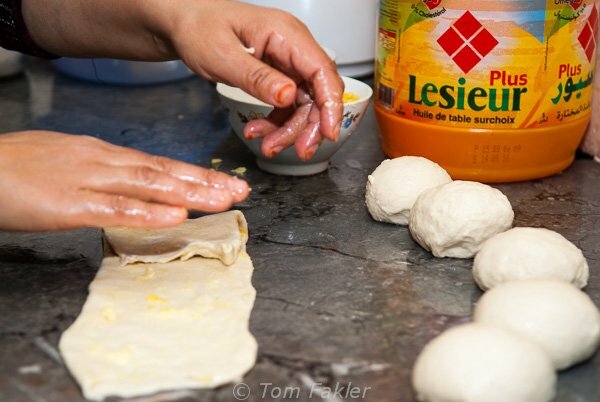 Mlaoui is the croissant of my Moroccan mornings, just one of the delectable pastries from a Moroccan kitchen. 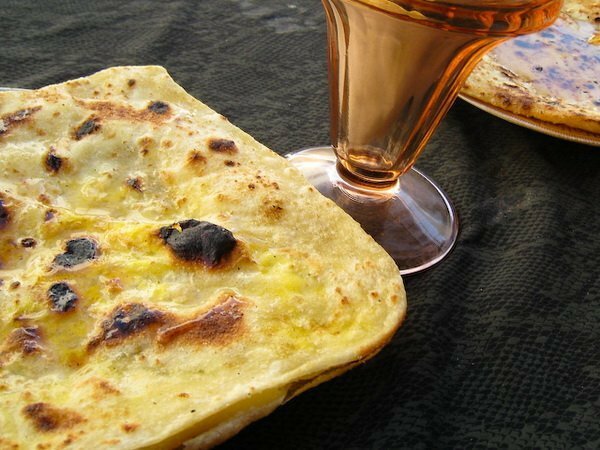 Thin, crepe-like layers dotted with butter and flecks of charred pastry, mlaoui wafts toast and honey through the oil-spotted brown paper, urging me to hurry home and make mint tea. Quickly, too, while the bread is still crispy warm. It’s neither crescent-shaped nor puffed, but the associations resonate. 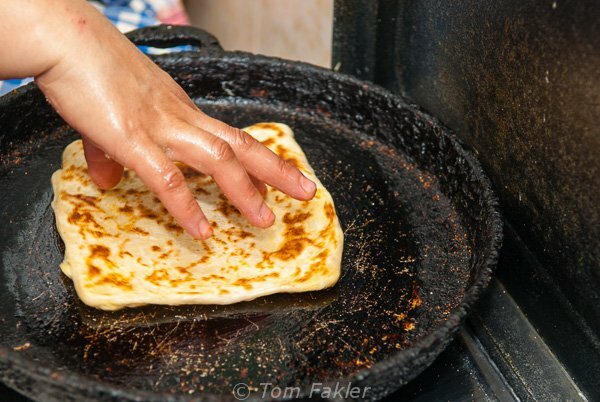 Mlaoui is my favorite breakfast in Morocco, at its best when purchased from two women who ply their griddles just around the corner from my home in the medina of Fez al-Bali. It’s a seduction I seek out time and again from these no-nonsense ladies with modest smiles. 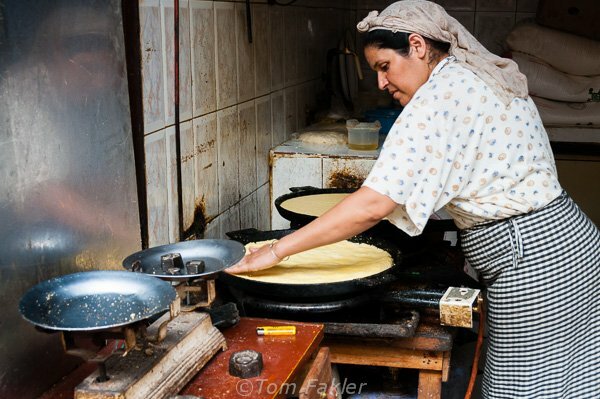 When she is not making mlaoui, this vendor prepares fresh harcha, a semolina flatbread—another personal favorite. She cuts portions to order and weighs them on a traditional scale. My friend has invited me to her kitchen in the New City for a cooking lesson. 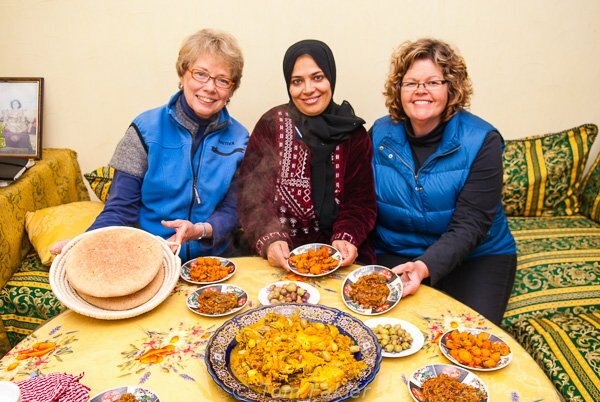 One November day, I was invited to prepare mlaoui in a Moroccan home kitchen. I had eaten at Asmaa’s table many times, and I already knew that, despite lack of a spoken language in common, we would manage with humor, hand waving and the language of food. Deb Rankine, the author of the popular Fridge Whisperer cookbook series, would come along with me. When we arrived, an already bustling Asmaa motioned to stash our coats and shoes, and put on babouches—soft, pointy-toed leather slippers—before daughter Fatima, seven years of enthusiasm and opinion ushered us into the kitchen. Winter chill in a Fez house can rival the outdoors, to a degree that startles newcomers. Homes are impossible to heat, their high ceilings and tiled floors and walls designed to fend off vicious summer temperatures. I was wearing two sweaters, a vest, and leggings under my jeans, but the floor was icy through my black babouches. Canadian Deb was in her element. The kitchen was brightly lit room, its white-tiled floors, and glass-fronted pantry gleaming. Pride of place went to a three-burner stove with an oven, something not found in traditional Moroccan kitchens. A buzz of cumin and a frazzle of coriander mingled with the aroma of freshly baked harcha. Family-sized bins and jars held olives, oil, flour, and couscous. A cast-iron griddle-pan straddled two-thirds of the cooktop’s real estate. A lime-green propane bottle with a terracotta collar squatted on the floor as a fourth burner, vegetables simmering. A plump chicken for the day’s tagine languished with lemon slices in a pink plastic tub. Our host was a model of friendly authority as she mimed instructions to chop and stir, accompanied by running commentary in Arabic. Deb and I sliced onions and carrots. 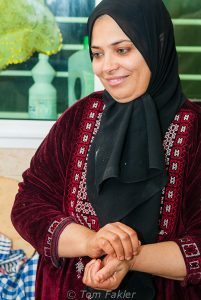 Asmaa prepared the chicken, scooping up olives and preserved lemons, and putting the lot into a pressure cooker. As the bird cooked, she would calibrate the time for the pot to spit and puff without reference to any timepiece other than the one in her head. We enjoyed breakfast and luncheon back-to-back, in a stomach-stretching two meals in one go. First, though, we had a mlaoui lesson. Asmaa swiped the counter-top with a towel, then mixed flour, yeast, and salt in a bowl, and added water. She turned the stiff dough onto the work surface, oiled and worked it into a ball, then set it aside to proof under plastic wrap. She mixed corn flour, baking powder, and butter in a smaller bowl, and set the mixture beside the dough. 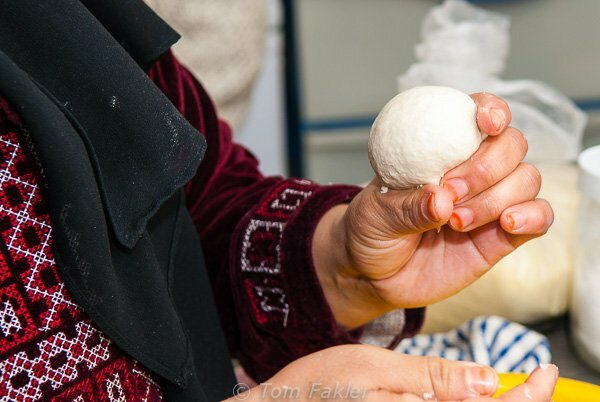 After oiling her hands, Asmaa divided the stretchy dough into balls the size of clementines, that Mediterranean fruit that greets the first frost. She smeared a paper-thin rectangle with a corn-flour mixture, folded the rectangle in thirds and patted it down to release air bubbles. Folding it again in thirds, she formed a square and folded the open end under, creating a packet. 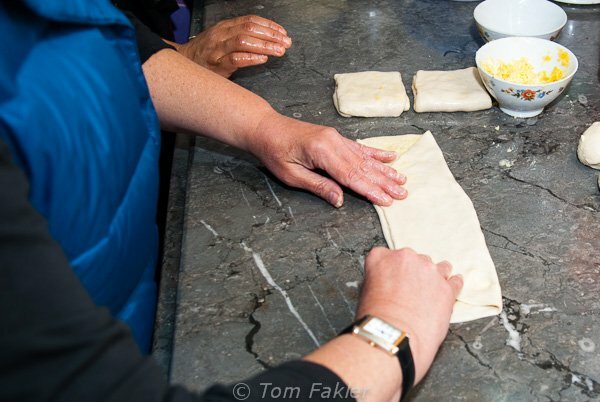 When it was our turn to flatten, square and fold, the process was easily mastered by Deb, a professional chef back home. For me, this was anything but effortless and the result, not all that square. Laughing and gesturing, Asmaa helped me. Fatima and older brother Hichab giggled from their perches on stools across the room. Asmaa worked a square of pastry until it quadrupled in size, slapped it onto a preheated griddle pan, and brushed it with oil. As it began to bubble and the bottom to brown, she flipped it with bare fingers, and then let it cook until speckled and golden. Removing the mlaoui from the pan, Asmaa squeezed gently. So, it’s popping the steam out that makes these goodies crisp. Eureka! 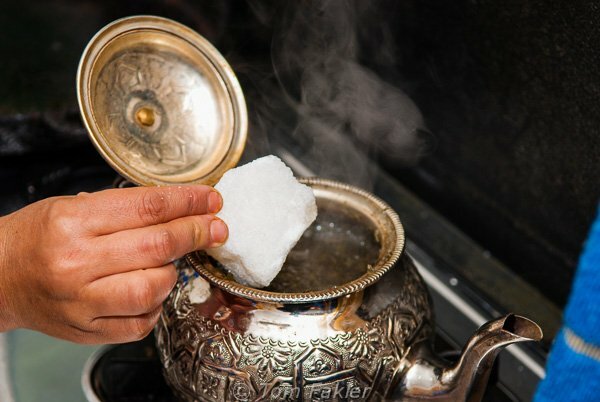 Aromatic mint tea steeps in its pot, sweetened with a Moroccan dose of sugar. Hichab and Fatima trotted back and forth to the living room, setting the dining table with a plastic tablecloth and saucers. Si Mohammed, Asmaa’s husband, poured orange juice as Hichab opened a pot of honey, thick and fragrant. Like the olives we would enjoy with our meal, the honey was ‘beldi’ and purchased in Fondouk Kaat Smen, in the Fez medina. Asmaa made sure the chicken was on track before we headed for the living room, kicking off her slippers to step on the thick carpet. We would have mlaoui as a first course, and then take a break to recover appetites before the mid-day meal. With a flourish, Si Mohammed streamed a loop of tea into a glass and poured it back into the teapot, then served everyone. I cuddled the fragrant tumbler that held in the warmth. Breaking off pieces of mlaoui, we slathered on honey and some dribbled onto my little plate. Asmaa adjusted her headscarf and beamed affectionately around the table. We raised our tea glasses, toasting friendship across the language divide. This article first appeared in Foreign Flavours, an anthology of food writing by Writers Abroad.